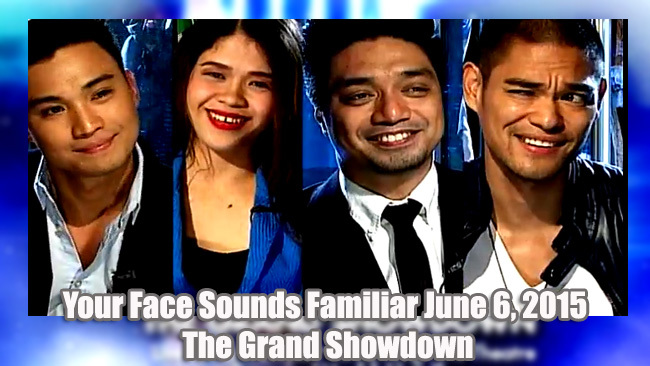 The Your Face Sounds Familiar Grand Showdown has started Saturday, June 6, 2015. The show started with the ”Good Time” performance by the Judges, Gary Valenciano, Jed Madela and Sharon Cuneta. The show also revealed the artists that will be impersonated by the Final Four. Edgar Allan Guzman picked Chris Brown, while Nyoy Bolante wanted a total transformation from boy to girl as he chose to impersonate Whitney Houston. JayR had chosen Frank Sinatra as a tribute to his Tito Reni and Melai Cantiveros had found similarities with Miley Cyrus and chose her as a perfect artist for her Final impersonation. The first performance is by Jay-R, in which he had chosen an iconic legend Frank Sinatra for his final impersonation. He said he wants to touch the hearts of the audience as he performs. He sang “New York, New York” song of Frank Sinatra, which he said is a tribute for his uncle Reni . Jed Madela said he had goose bumps as JayR sings and he really looks and sounds Frank Sinatra. Gary Valenciano mentioned that JayR really put passion in all his performances and his Tito Reni is sure proud of him. Sharon Cuneta is all praise to JayR’s performance. Edgar Allan dedicated his performance to his Father. For his final impersonation he had chosen his idol, Chris Brown. “Turn Up The Music” performance of Edgar Allan electrified the stage of Resorts World Manila as he danced like Chris Brown. Sharon Cuneta had pointed out the developments of Edgar Allan from the beginning till his final performance. Jed Madela commented that Edgar Allan is a revelation of the show, as he shows his dancing skill. Gary Valenciano compared Edgar Allan to a diamond entertainer as he progressed to a great entertainer. “Wrecking Ball” by Miley Cyrus is the grand showdown performance of Melai Cantiveros. The fierce, naughty and fearless Miley Cyrus is accurately portrayed by Melai Cantiveros as she wrecked the stage of Resorts World Manila. Everyone is amazed by her performance especially her own husband Jason Francisco, who is in the audience to give his support to his wife. Sharon Cuneta said she will miss Melai for she makes her happy in all her performances. Jed Madela pointed how amazing Melai is and Gary Valenciano stressed that Melai had chosen the right and perfect artist for her performance and her performance is always unpredictable. Nyoy Bolante is last to perform in the Grand Showdown. The ‘Diva Of All Time’, Whitney Houston is his chosen artist for his final impersonation with the song “I Will Always Love You”. He blew away the judges and the audience with his performance dubbed as ‘Whitnyoy Houston’. Gary Valenciano cited Nyoy’s performance as a professional and courageous performance. Jed Madela said that Nyoy is really good, excellent and consistent with his very good performance. Sharon Cuneta commented that there is nothing Nyoy can’t do because he is good in every performance that he does. The very first winner of the show will be determined by text votes. Voting is now open and the winner will be announced tomorrow, June 7, 2015. At the end of the show, Billy Crawford, the show host, announced that there will be a second season of Your Face Sounds Familiar.